Hi, Royal Enfield Motorcycles are a distinct and different breed from most of the mainstream, so it would be fair to say that the owners and riders of these machines tend to be a bit different....So it would also be fair to say that owners and riders of Diesel Enfields are the subculture to the subculture. The history of these bikes gets a bit blurred as there are many home/semi-professional conversions offered in addition to the genuine factory bikes - Yup thats right the Royal Enfield Factory in what was Madras did offer an official factory diesel bike. 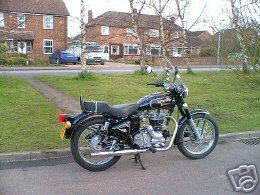 My own diesel is a 1965 petrol converted to diesel in Chennai and imported to the UK by F2 Motorcycles. 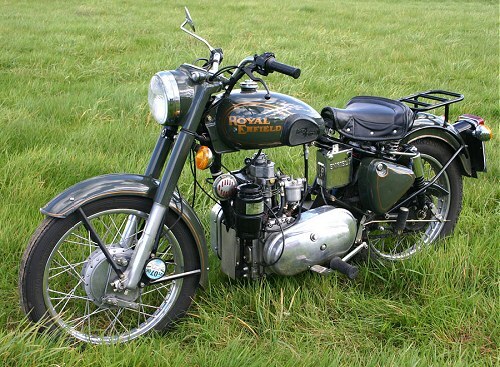 I also run a 2003 Royal Enfield 500ES, this has the luxury of an electric starter as well as more than 3 times the power of the diesel. There are a number of modifications I have undertaken to make the bike more useable than it appeared in standard trim. I bought the bike with less than 3000km on the clock so it was nicely run in and had the screen fitted. To date the bike has almost 16,000km mostly due to commuting into London from the wilds of Essex. To sum up this bike I would say it's the most comfortable and stable bike I've ever ridden, in std form it's a bit gutless and runs way too lean for my tastes but it is capable of over 90mpg.